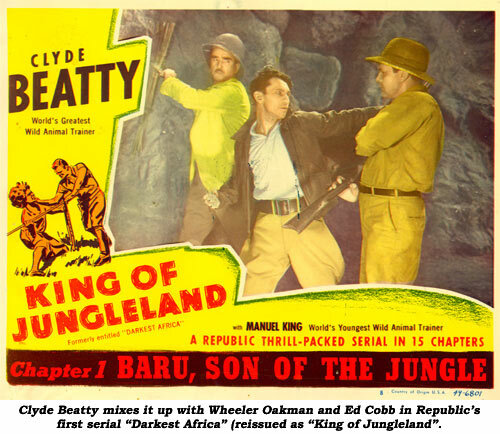 Serial Report Chapter 27-"Red Barry" serial, Buster Crabbe, Marion Shilling, Edmund Cobb. I liked Buster Crabbe when he played Flash Gordon, his signature role. In other parts, however, I often had a problem accepting the 100% pristineness of his heroic character. There always seemed to be something of the bullyboy about him, an uncomfortable suggestion that if the right mood was upon him he could easily turn nasty and abusive. I suppose that’s why it never bothered me all that much when he occasionally played a bad guy—opposite old swimming buddy and rival Tarzan Johnny Weissmuller in “Swamp Fire” (‘46), for instance. 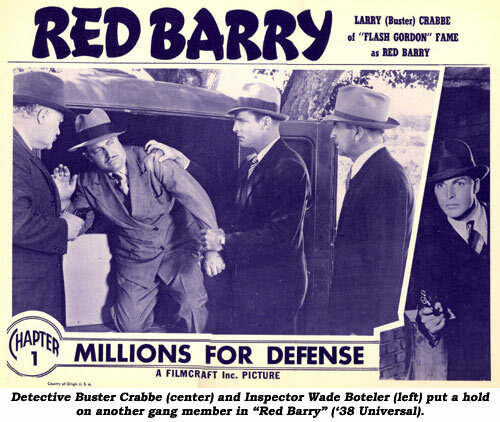 In “Red Barry” (Universal ‘38), Buster portrays a wise-cracking, slightly unorthodox—and not always particularly bright—flatfoot, a character based on a popular comic strip of the time by Will Gould. He’s actually pretty good in the part; breezy, indolent and sarcastic when lounging about in the squad room, but full of Flash Gordon testosterone when things are up against him and his pals. Since I’m not all that familiar with the cartoonist’s original comic strip concept, I don’t know if Crabbe’s cinematic interpretation is accurate. 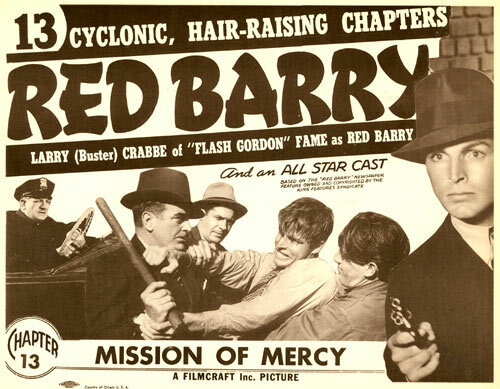 In any case, Red Barry is a fast-paced cliffhanger energetically directed by the team of Ford Beebe and Alan James with breakneck action, a few unique chapter endings (buried in coal; attacked by a nightclub lion, etc.) an offbeat plotline and some over the top, almost tongue-in-cheek performances. The somewhat confusing storyline has Red, popular with his immediate superior Scotty (Wayde Boteler) but not so with the City Hall uppity-ups, investigating the theft of millions of dollars in bonds stolen from a friendly Asian nation (pre-WWII politics prevented more specific labeling of the foreign good and bad guys). Before the final chapter, Red finds himself in a deadly cat and mouse game full of espionage, dangerous fem fatales, and a host of villains out after both the bonds and our hero’s neck. I enjoyed this serial more than I thought I would. 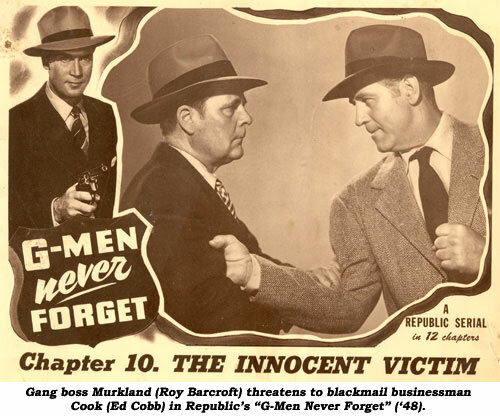 It reminded of the hundred or so little crime movies of the same period involving detectives and newsmen that I grew up with. You don’t take anything too seriously for a moment. You just breeze along with it, enjoy the ride and sometimes it’s an exciting one. Frances Robinson essays the traditional glib newswoman of the ‘30s part and Hugh Huntley is fun as the eccentric and effete investigator Vane (a kind of parody of S. S. Van Dine’s popular sleuth Philo Vance) while veterans Frank Lackteen and Philip Ahn are also on hand. “Red Barry” falls into the middle ground of serials, nothing special but moderately entertaining and occasionally quite a bit of fun. You could do worse with several hours. Modern TV, as an example. At the conclusion of Ch. 2 in “Robinson Crusoe of Clipper Island” we see Mala plunged forward and falling into a volcano crater. But, in Ch. 3, he is saved by friends before he ever falls. 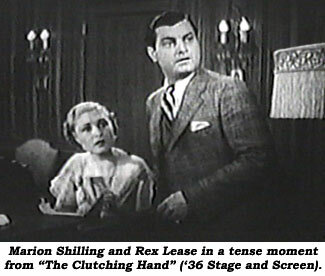 Among Marion Shilling’s films were two major serials, “The Red Rider” (‘34) with Buck Jones and Grant Withers and “The Clutching Hand” (‘36) with Jack Mulhall, Ruth Mix, Rex Lease, Mae Busch and a long roster of stars from the silent days of pictures. “One day while making ‘Red Rider’, I thought it was a good idea during a long wait between scenes to go off by myself to an isolated place and practice riding a bit. I soon became aware of someone following me. I looked around and there was Buck Jones. As I caught his eye, he started laughing and said, ‘Marion, that’s the best example I’ve ever seen of a horse riding a girl!’ Buck, over a period, gave me some excellent tips that were very helpful. Buck was a dear person, thoughtful of everyone. 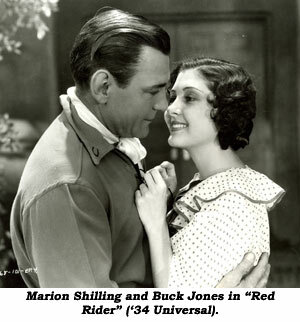 He told me one day that he wanted to introduce me to someone,” Marion recalled. Buck guided her to an old Indian sitting in the corner of the set. “Marion,” Buck said, “I want you to meet Jim Thorpe.” “Not the Jim Thorpe,” Marion exclaimed. “The very one,” Buck answered. (Thorpe was a famous Indian athlete who later worked in films.) “I’m certain Buck staged this incident more for Jim’s benefit than for mine,” Marion confided. In “Secret Agent X-9” (‘37), X-9 and another G-Man (Henry Hunter) hitch a ride on an Empire Moving Van which an Empire employee is driving, except in one closeup, G-Man Hunter is driving. Edmund Fessenden Cobb was born June 23, 1892, in Albuquerque, NM, the grandson of an editor of the KANSAS TRIBUNE and one-term U.S. Senator (1866-1871). Instead of returning to Kansas, Cobb’s father settled in New Mexico, eventually becoming Governor of the Territory appointed by President Grover Cleveland in 1885. Four years later, he took up a law practice. Young Ed was being prepped by his grandfather for a life in politics, however, he died when Ed was 15. Meanwhile, Ed was becoming interested in local theatrical productions. 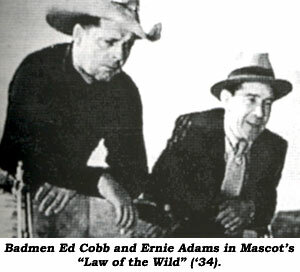 Around 1910, when Ed was 18, the St. Louis Motion Picture Co. came to Albuquerque to make a picture which introduced Ed into a 56 year career in western film making. At first Ed worked as a stuntman, extra and bit player, making it impossible to know what early titles he appeared in. It is known he appeared in “Pueblo Legend” in 1912. In 1914 he was in what is considered the first silent serial, “Adventures of Kathlyn” (Selig) with Kathlyn Williams and Tom Santschi. Cobb headed for the Essanay Chicago studios in 1915, ultimately playing roles in some 35 of their productions between 1915-1916, including “Strange Case of Mary Page,” a 15 chapter Henry B. Walthall serial. 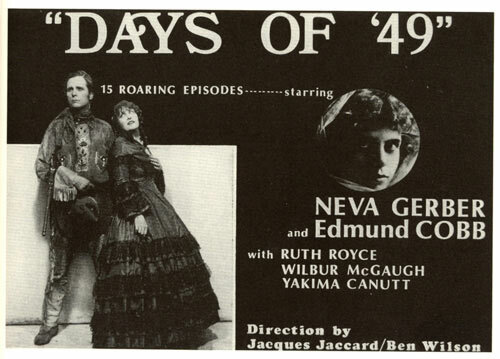 “Days of ‘49”, in which he was the hero saving Neva Gerber, was released in 1924 by Arrow and “Fighting With Buffalo Bill” came along in ‘26 from Universal. Cobb was the gallant plainsman aiding Wallace MacDonald for 10 chapters. These were followed by “A Final Reckoning” (‘28 Universal) which saw Cobb as a heavy opposing Newton House for 12 chapters and “Scarlet Arrow” (‘28 Universal) starring Francis X. Bushman Jr. 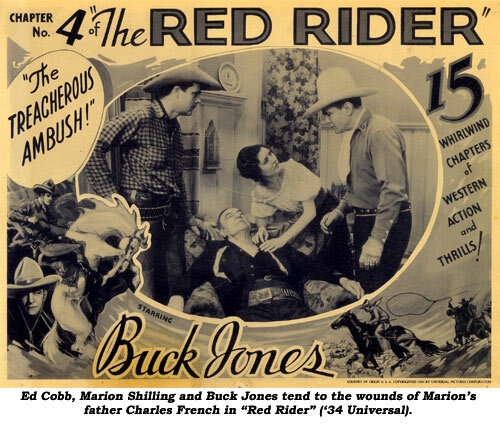 In the ensuing years his personality and horsemanship paid off, allowing him to work in 63 silent and sound serials and over 500 other films, mostly westerns. 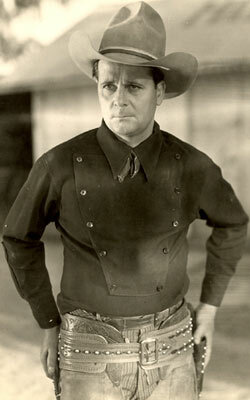 Cobb played a friend to Tim McCoy in Universal’s bridge-over release between silent and sound serials (being released in both versions), “The Indians Are Coming” (‘30). 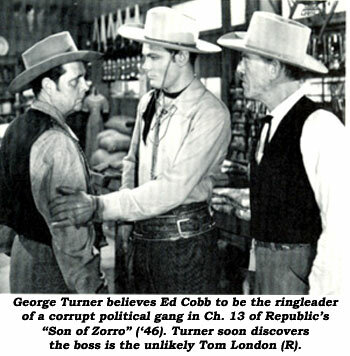 Cobb continued as a featured player in serials throughout the ‘30s, ‘40s and ‘50s, playing every type of role written—but specializing in heavies. 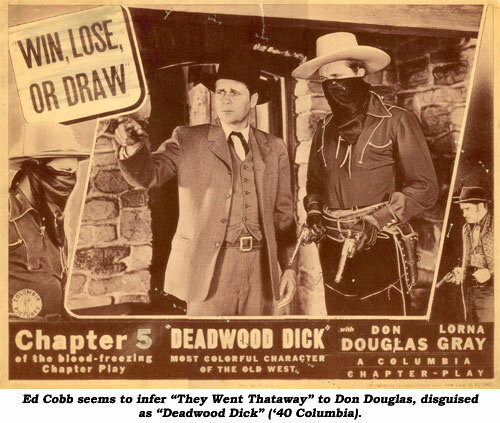 When the serials ended, Cobb continued to work, with his last role being a bit in producer A. C. Lyles’ “Johnny Reno” (‘66). By others who knew him, Cobb is described as a quiet, unassuming, down-to-earth, polite, gentleman. In poor health, Cobb was admitted to the Motion Picture Hospital where he died of heart attack August 15, 1974. His illustrious career spanned six decades and the entire spectrum of silent and sound serials.